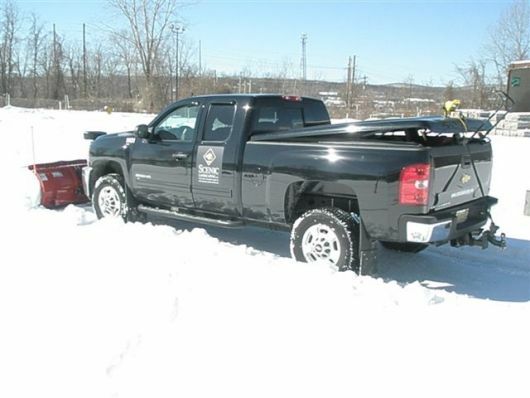 During these harsh winter months throughout New Jersey, we offer commercial snow removal services to our clients. Whether you are a property manager or a business owner our commercial snow removal, snowplowing, and commercial sweeping services will help keep your property looking clean year round. One of the first things that people look at is the cleanliness of the property. Dirt, gravel, and other materials sitting around on the pavement will eventually start to deteriorate it. By using our commercial sweeping services, all of the dirt, grime, and garbage will be picked up making the area look spotless. It is one last thing you need to worry about, we are taking that responsibility off of your plate. With our commercial snow removal and snowplowing services for our client’s properties, you are in good hands from flurries, to ice, to blizzards. Our snowplowing equipment will help keep your property free from any problems due to snow or icing every time. Scenic’s crew of commercial snow removal professionals will be onsite servicing your property in a timely and professional manner and help provide you with the peace of mind that your customers will be safe at all times. One of the biggest concerns for commercial properties is the safety of their clients and their employees. Snow is a big liability and a main cause of injury and accidents on site. Working with an insured and reliable company allows for this concern to be handled properly. With Scenic Landscaping, our commercial snow removal crews are out salting the roads before a storm and don’t go home until the last of the snow has fallen. With our state of the art equipment, we are able to keep up and plow through the very worst blizzards, ensuring that your commercial property is ready for pedestrians to access safely. Our clients want to know that the commercial snow removal contracts they are investing in, is money well spent. It is a necessity for business owners to take care of the property, and they want to be able to trust the company they partner with through the winter seasons. We take a lot of pride as well as precaution when it comes to our snow removal services, since we understand the risk and need for safety in commercial lots. Many of our employees today have been servicing our commercial snow removal clients for decades and are the best in the business. To learn more about our commercial snow removal services feel free to check our website and contact us if you are looking for a commercial partnership.